Here is my recap of the Washington DC ASTD ICE 2014 conference. This was my second ICE conference (I attended Dallas last year) it was huge and it was interesting. Most of the sessions were very good (just a few disappointed me). I did find it different from last year. I’m always looking for trends and found four major ones: Big-Data, Speed of Change, Leadership Development and Retention. I did check my recap of last year. The trends were workplace learning and informal learning. Big data was all over the place, and it is connected to the personalization trend. The message is that we, L&D people, can do for learners what Google and Facebook are already doing for us. Collecting and analyzing learner data in order to get to know learners so well, that you can offer information and learning experiences when you think of them, which may be before the learner even realizes they need it. This is the main trend I see at the conference; the speed of change is becoming faster and faster and companies are struggling to keep up. It is what Stan McChrystel (see keynote report) calls the ‘adaptability gap’. Therefore companies are in need for a higher speed of adaption and change. Changing your company means changing your people, changing your people means changing their behavior. Two ways of doing that faster and more effectively are: Leadership development and better retention. There were many sessions on leadership development, and this focus was also seen at the expo. I haven’t counted them, but leadership development tools, programs, books and training were all over the place. The key to this trend is that research shows that change is initiated by senior management, but carried out by middle management. I heard somewhere that improving training can lead to 4% improvement of production, improving your middle management can lead up to 20% increase! Another trend driven by scientific research which Hermann Ebbinghaus found long ago, is that if we learn something once, we will forget 80% in no time. So in order to increase retention you have to repeat it over and over again. There were many many referrals to this fact in presentations, but also at the expo there where a lot of tools that were claiming to solve this problem: Mindgym, Mindmaster, Mindsetter, and Memo trainer to name a few. 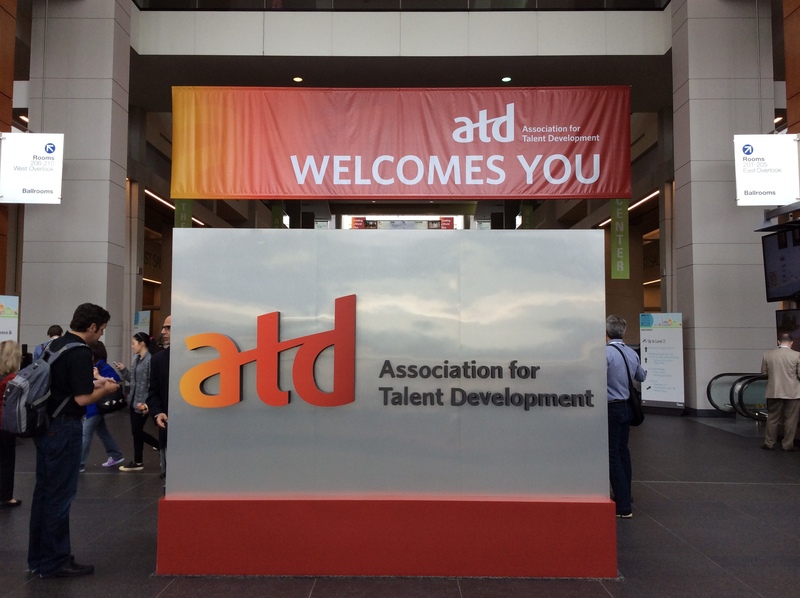 During the conference ASTD announced a new name, it is now ATD the Association for Talent Development. They had a special session announcing it and they have re-branded the whole conference overnight. They really made an effort. I made that mistake once as well. In the nineties I was CEO of a Dutch Internet start-up, called Locatienet. It was a sort of Google Maps before Google Maps was there. I started as a one-man business unit in another company and then we got some shareholders on-board and we became a separate company. For us that was a huge deal, we re-branded, launched and did a lot of things, but the public could not care less. It didn’t affect the services at all, so why should they. It is the same with the ASTD; they will continue doing the same things, so ASTD or ATD, what is in a name? But I did love this conference. I will be back next year at the ATD ICE in Orlando. I will attend Mlearncon in San Diego next month (June 23-26). I will blog again, so if you want my perspective on that conference and mobile developments, come back in June to this blog.